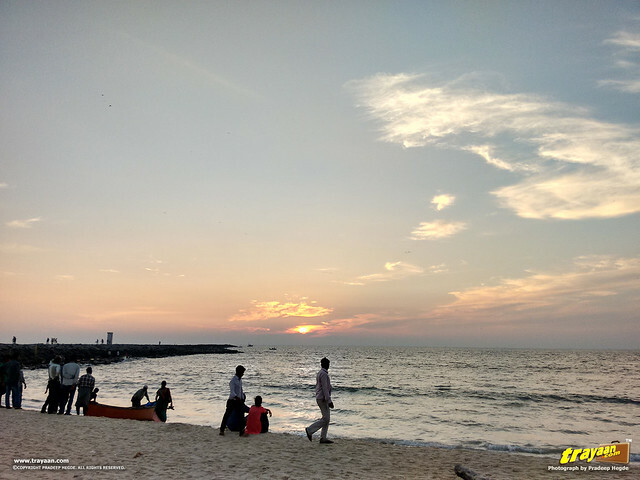 Panambur Beach is the most popular, well connected and most visited beach in Mangalore city (now, Mangaluru), and also in coastal Karnataka. 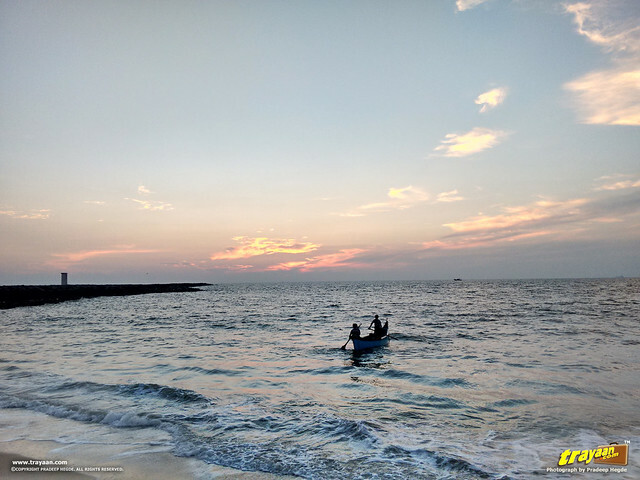 This is a beach along the Malabar Coast, facing the Arabian Sea; bustling with local visitors and tourists from all over the state and nearby areas. Note: Mangalore is now officially renamed as “Mangaluru”. But there will be several places and instances you will still see the name “Mangalore” in use. The people always seem to be in and around the central part of the beach you encounter just as you enter the sands through the main passageway. On either side, if you take a little walk, you can easily find some un-crowded spots. This is what we used to do in our good old days, our younger days when we visited here. We used to take a short walk up to the rock wall. 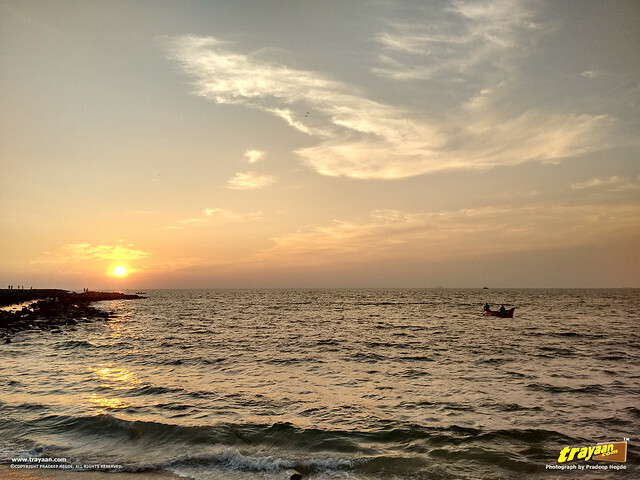 Panambur beach happens to be just beside the New Mangalore Sea Port. This rock wall, or the rocks we are referring to is actually the north rock wall or the northern breakwater of the sea port entrance. They are used to protect an anchorage from the effects of both weather and longshore drift. 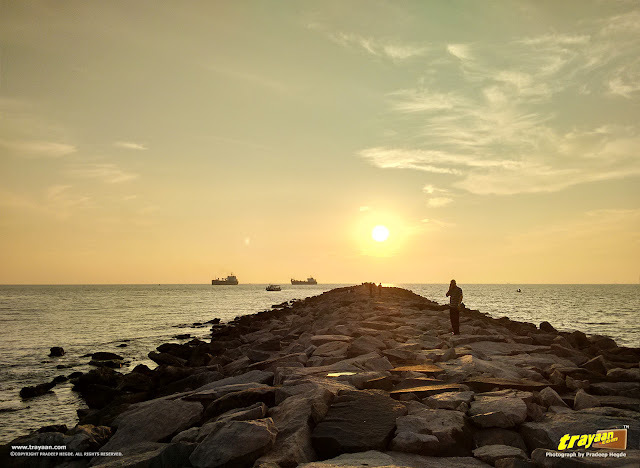 We used to take a walk up to the end of the rocks, sit there, have some peaceful time watching ships and boats in and out of the port, and then return after a while. After a long time, about a couple of years, we came up to this beach recently. As usual, the crowd was collected in the central area, and we decided to take a walk on the rocks. 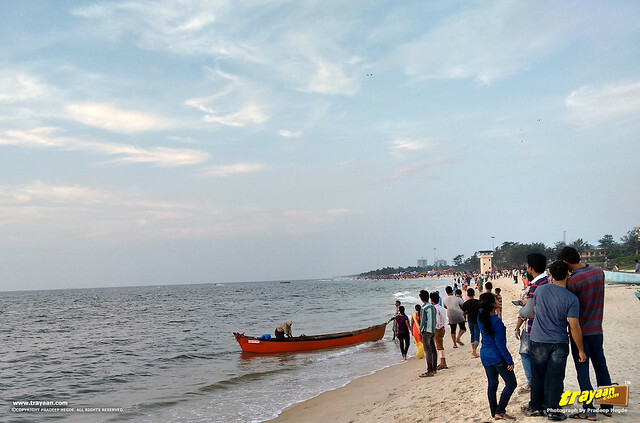 Earlier, this beach had only a few small chaats and eateries, but now, it has many eateries, lifeguards, boat rides, etc. 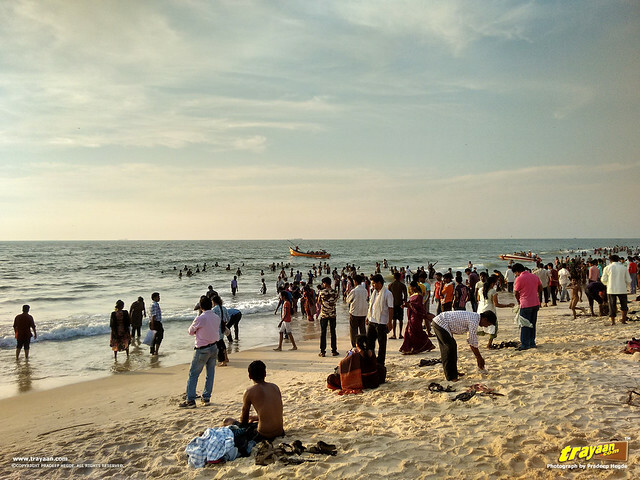 Many beach festivals are now occasionally organized here. The beach is now run and maintained by a private enterprise, called the Panambur Beach Tourism Development Project. Their lifeguards have saved 92 lives till date . There are some urinals and toilets too, which weren’t there before commercialization of this beach. One thing we noticed this time, is that the shoreline has receded more than before. It may look so more due to the tides, but the shoreline was much forward some ten years ago, and there was more sandy area between the sea and the trees. This is due to coastal erosion, which results in corrosion of beach sand or land adjacent to the sea. This occurs all along the coastline. As we approached the breakwater rocks, we noticed some fencing, as if to keep people from getting on them. This wasn’t there earlier. But there were a lot of people walking on the rocks, and the fencing had come off, fallen in some places, possibly during bad weather. There was no note on the fence too, so we decided to take the walk anyways, joining other walkers on the rocks. 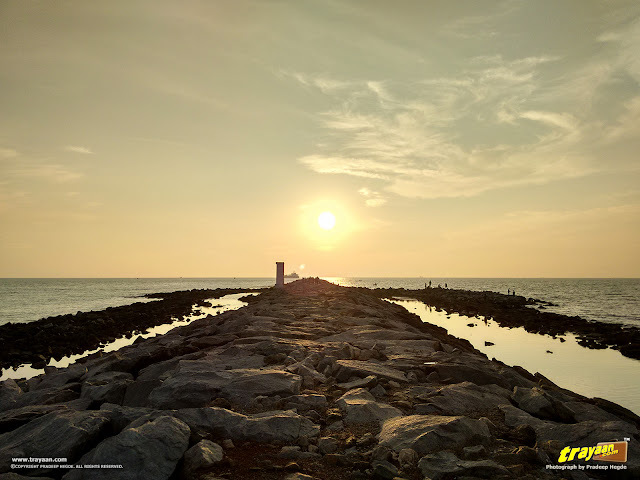 We walked on, bringing back memories of our younger days with some ships and motorboats passing by, as we approached the end of the breakwater. On an approaching boat, we saw some people on it signalling something. As it came near, it became clear that they were signalling people to turn back and keep off the rocks. It looked like some security guards on the boat. Some people started returning, and some ignored. 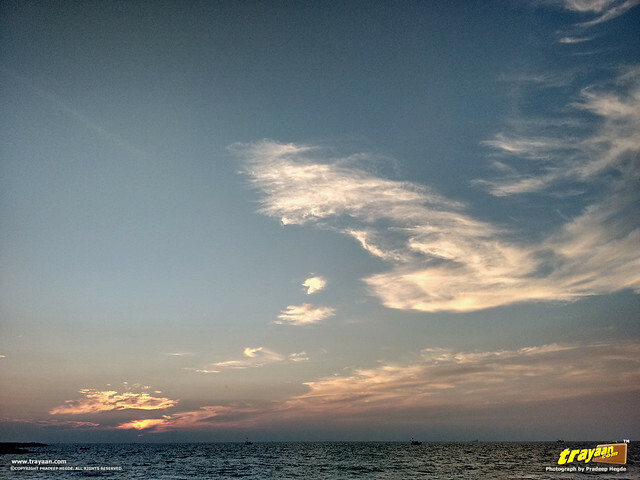 However we returned, got off the breakwater and headed back to the beach to enjoy the sunset there. If the port authorities really want people off the rocks, a better fencing or walls have to be in place with a clear notice to keep off! As of now, there is no note, and the fencing is down at some places. We came to know later that this fencing mesh has been put to keep people out by the port authorities. From a safety point of view, the water gets very deep along the rocks, especially as you near the end of the rocks. These rocks can be slippery at many places and people are reported breaking their limbs. Also, if you slip off and fall into the sea here, there is no saving you. 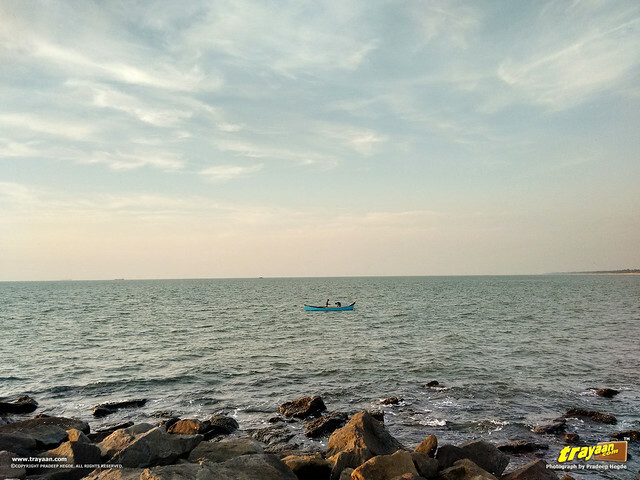 According to a report on The Hindu that we later found, the port has to abide by International Ship and Port Facility Security (ISPS) Code  and keep the breakwater free of people. Otherwise, a vessel's captain, can raise an alarm that this port is unsafe for navigation . So, dear readers, keep off these forbidden rocks if you visit here. The breakwaters are forbidden, and do not walk on them. Yes, its sad that it is prohibited, barring us from the ambience, but respecting the regulations and following the safety standards is important. We wonder why the beach administration hasn't picked up the idea and made some kind of a boardwalk into or along the sea. People would love walking on that. We then walked on the beach, watching the sun go down. 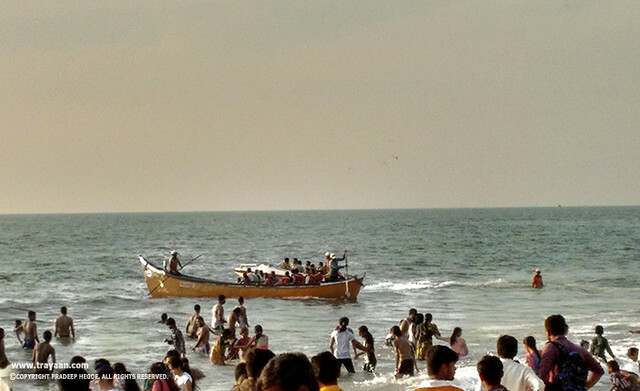 The fishermen who were fishing in small boats began returning to the beach. 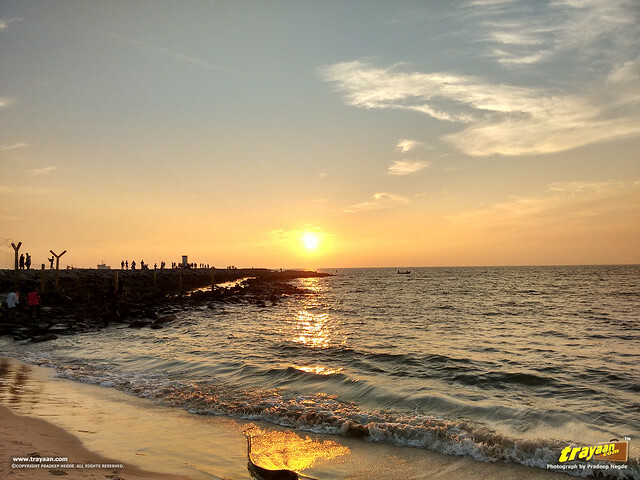 We have witnessed several beautiful sunsets here. I like the ones standing near the rocks, as it gives some substance in the picture. As the sun set, they pulled their boats on the sands, and went back home with the catch. It was time we headed home too. 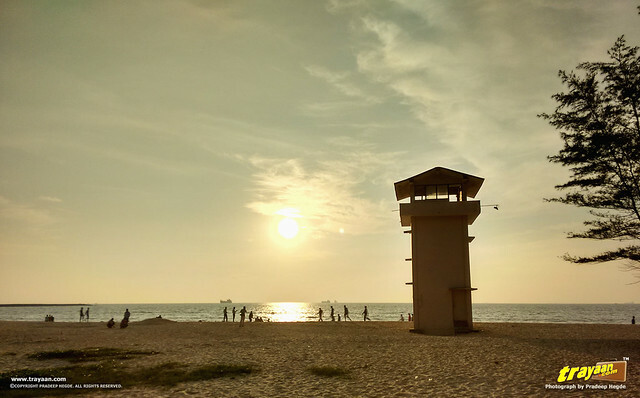 Its a nice beach to visit in Mangalore, but don’t expect too much, its no Goa! 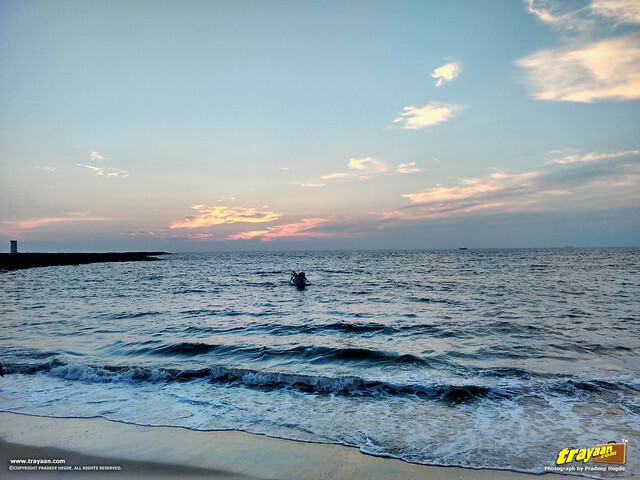 Visit for some little fun in the waters and beautiful sunsets with family and friends when you are in Mangalore. All in all, it was a pleasant evening on our part. Most people who come here like this beach; it may seem average to some. But for us, it is the nostalgia that accompanies the beautiful sunsets and evenings, memories of our younger days. Warning! Do not swim here. Lot of people have lost lives trying to swim here. Earlier, there was a board with statistics of life lost who tried swimming here. Do not go deeper into the waters, as the sea gets deeper quickly, and also the water currents get stronger. 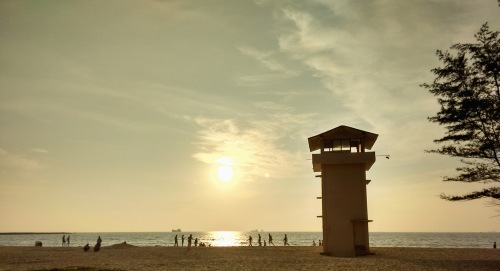 Although the lifeguards have saved several lives there are instances of lives lost . So, better not to swim. Do not get into deep waters, or go too forward in the water. Have fun in the shallow waters along the beach, be safe. Panambur Beach is well connected by public transport. There are several city buses from the main bus stop in statebank. 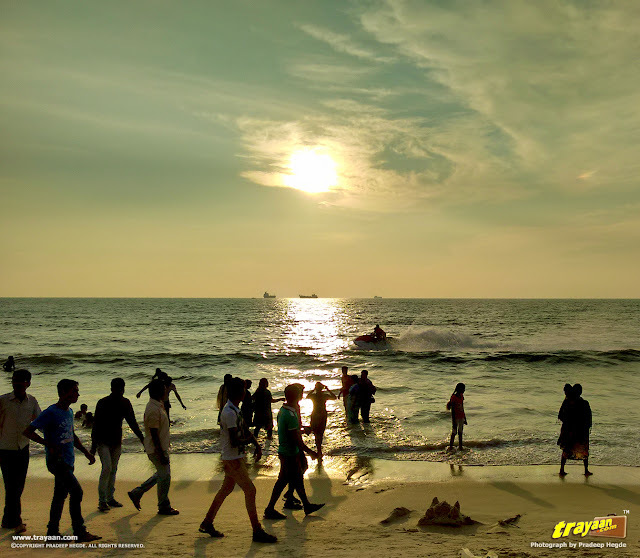 You can also take the non-express service buses that give a stop for Panambur Beach right at the Panambur Beach road joining national highway NH66 (older number: NH17). Once off the bus, you can take a small walk down the road leading to the beach. Take the same route if going on own or hired vehicle. You can use the map below for driving directions. A parking fee is charged for vehicles here (Rs. 20 for a two wheeler. The price is more for four wheelers and buses). On weekends and main holidays, the parking space might be full. There are several eateries and food stands on the beach, but we did not eat here recently. 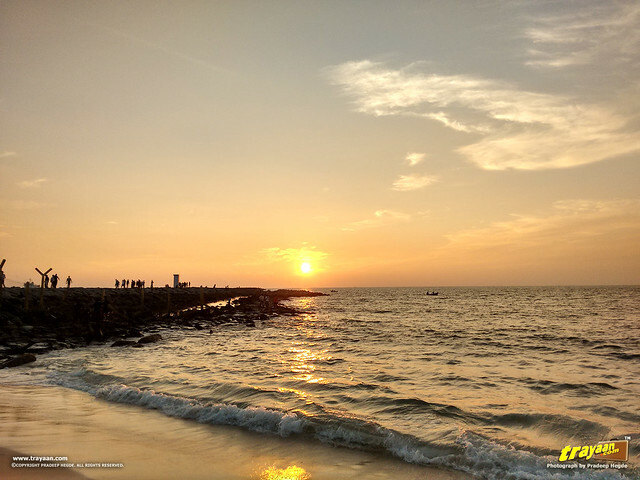 If you decide to stay, Mangalore city has plenty of good places for food and accommodation. 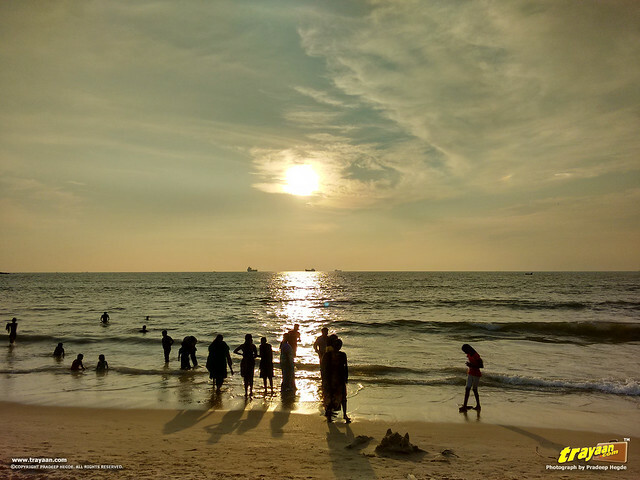 Tannirbavi beach, another popular beach of Mangalore, just ~7 kms south. Lifeguards save youths from drowning at Panambur beach on Times of India. 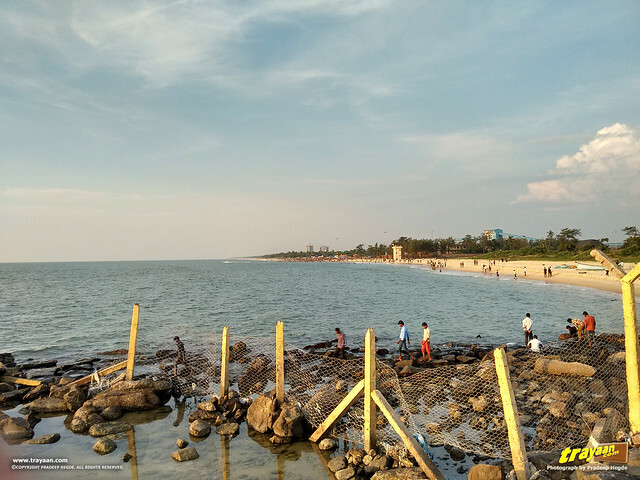 Forbidden breakwater lures Panambur beach-goers on The Hindu. The International Ship and Port Facility Security Code (ISPS Code) From Wikipedia, the free encyclopedia.